Bracing For A Battle, Vermont Passes GMO Labeling Bill : The Salt The Green Mountain State is poised to become the first to require GMO labeling. But a federal lawmaker recently introduced a bill that would outlaw state rules like Vermont's. A customer shops for produce at the Hunger Mountain Co-op in April 2013 in Montpelier, Vt. More than a dozen food cooperatives supported the bill that would require the labeling of genetically modified foods. The Green Mountain State is poised to become the first to require food companies to label products containing genetically modified ingredients. Vermont Gov. Peter Shumlin tweeted he will sign a bill state lawmakers passed Wednesday mandating that foods with GMOs be labeled as having been produced with "genetic engineering." The bill would also make it illegal for foods with GMOs to be labeled "all natural" or "natural." While Maine and Connecticut have already passed GMO labeling bills, those bills contain clauses that keep them from going into effect until surrounding states pass similar rules. Vermont's bill would go into effect on July 1, 2016. 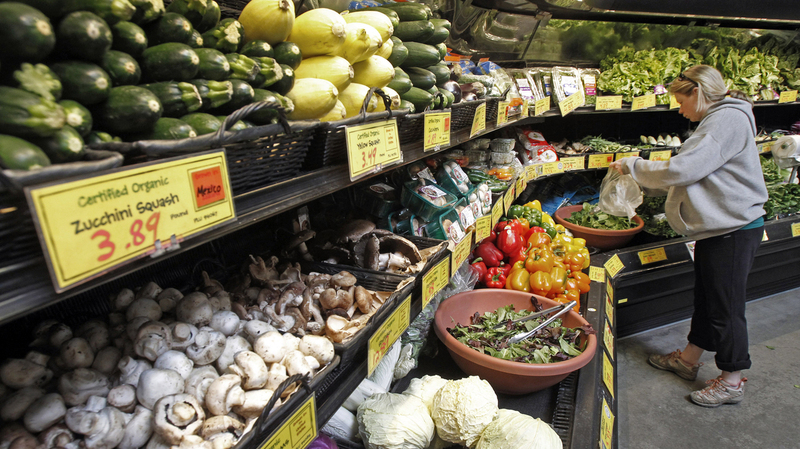 For the past few years, consumer advocates have been ratcheting up the pressure on states and the federal government to require labeling, arguing that information about GMOs is essential if we're to make informed decisions about what food to buy. Meanwhile, the food industry has resisted the idea of labeling, arguing that GMOs are safe and that labeling costs would be passed onto consumers. What's The Most Important Thing Food Labels Should Tell Us? But recently, they changed their tune a bit. As we reported in February, a food industry coalition representing farmers, seed companies and other food producers who rely heavily on GMO ingredients said they support voluntary labeling standards. And they asked the Food and Drug Administration to outline what they might look like. The Grocery Manufacturers Association, which led that coalition, responded sternly to the passage of the Vermont bill. "It sets the nation on a costly and misguided path toward a 50-state patchwork of GMO labeling policies that will do nothing to advance the safety of consumers," the association said in a statement. The state attorney general, Bill Sorrell, is anticipating a legal challenge. "I'll be very surprised if we are not sued if the legislature goes ahead and enacts a mandatory GMO labeling statute," Sorrell told Vermont Public Radio on April 14. "A lot of people might not realize that this is arguably a free speech issue." In anticipation of a legal battle, state lawmakers included in the bill a fund for legal defense. Foods containing GMO ingredients are common in the U.S. Some 90 percent of America's corn and soybeans are genetically modified, and egg, milk and meat producers feed their animals with those crops. But they are not required to be labeled because the FDA says they do not raise safety issues. Once a rather niche issue, there are signs now that concerns about GMOs have gone mainstream: Federal lawmakers are weighing in. Rep. Mike Pompeo, R-Kan., recently introduced a bill that would create a federal voluntary GMO labeling plan, but it would also outlaw state rules like Vermont's that require GMO labels. Labeling advocates lamented the failure of 2013 ballot initiatives to require labeling in California and Washington state, but they welcomed the news from Vermont. "This is a huge victory for consumers across the country ... Vermont's law will establish a precedent that other states are sure to follow," Gary Hirshberg, chairman of Stonyfield Organic and the Just Label It campaign, said in a statement. Jeremy Bernfeld is a reporter for Harvest Public Media.